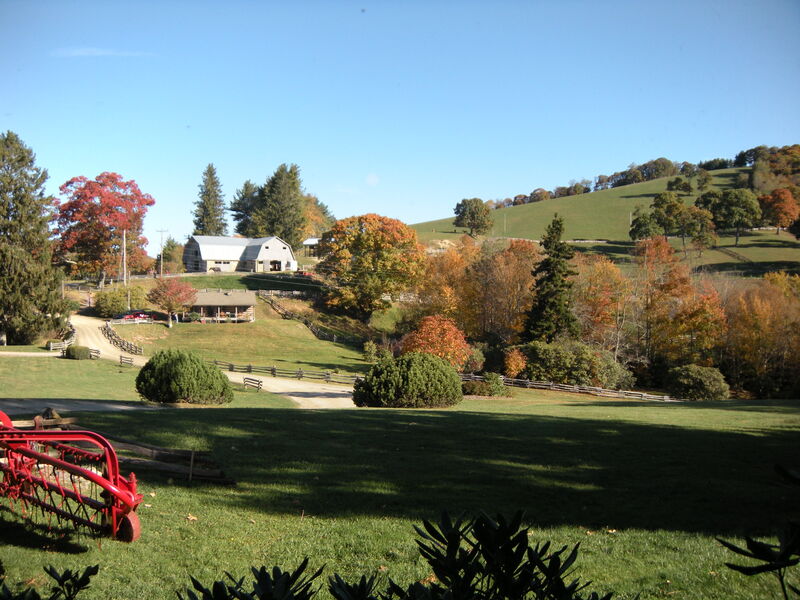 Morning dawns cold and clear as the sun rises over the mountains of Maggie Valley and all around the Creekside Lodge, one can hear the sounds of motors cranking and warming up for the daylong drive through the mountains of the Blue Ridge. From all over they have come, bearing license plates from Florida, Georgia, South Carolina, North Caroline, Tennessee and even Indiana. 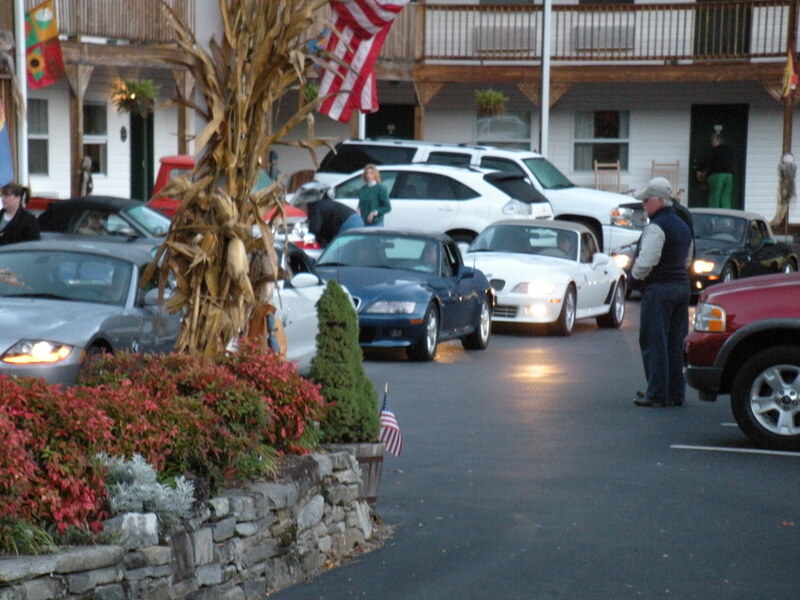 BMW Z3’s and Z4’s, convertibles and coupes, in all colors, plus one stray Porche that came along for the fun. Tires are checked, gas tanks full, a tweak here and a check there and the caravan began to line up for the beginning of the drive. A few hearty souls are brave enough to drop their ragtops and brave the 40 degree temperatures, guaranteed to be colder as the cars gain altitude on their way up to the first stop. Our leaders, Greg and Ken, will take the group in its entirety to our first stop and the caravan slowly gets underway, a long line of Z’s heading out on the highway and up the foothills to enter the Blue Ridge Parkway. 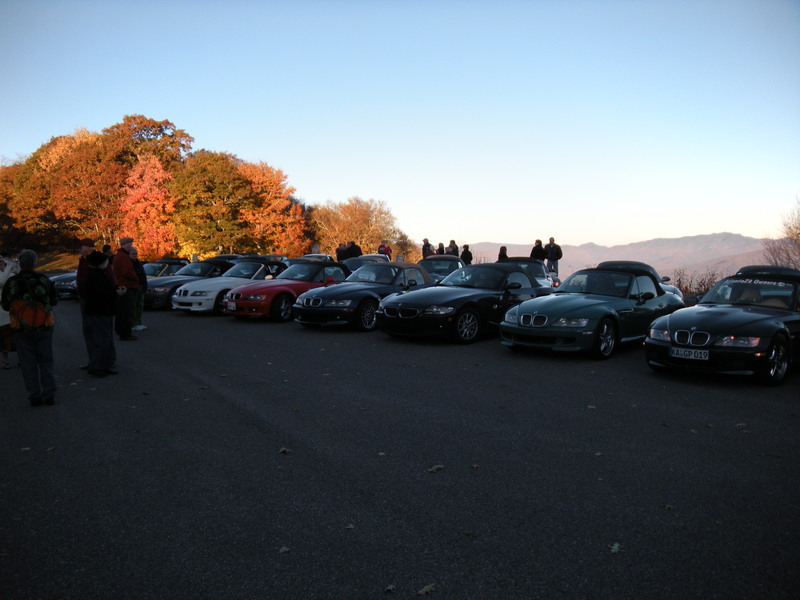 A few miles up the parkway, the group pulls in to an observation area and lines up for our annual group photograph, a tradition of the drive, made as the sun breaks out over the range of mountains, bathing everything in a bright reddish-golden light. The cars are backed in, row upon row and everyone, bundled up against the cold mountain air, takes a few minutes to speak to each other and get in position for the photograph. When everyone is lined up, Greg sets the timer on his camera, runs back down to the group and makes it just in time for the shutter to capture the moment forever. From here, the groups will split into two groups, following a preprogrammed route programmed into the many GPS navigators carried by the drivers. Handheld radios are employed for communication between the leader and the followers in each group, which leave in ten minute intervals. In each group, there are two key positions: the Leader and the one riding “Drag”, the person at the very end of the line. The Leader’s job is to lead the group on the drive and watch for road issues such as pedestrians, gravel in the road, oncoming traffic in low visibility areas and any other road hazard that might create a dangerous situation for the drivers in his or her group. The Leader also alerts everyone when a turn is coming up and sets the pace of the drive-slow, faster or all out fun. The person riding drag makes sure that no one gets left behind and alerts the Leader when the group gets broken up by traffic lights or if an outside car manages to insert itself into the lineup. The Leader can then adjust the pace to wait for the rest of the group or pull them over if necessary. When the group stops, for photo shots or other reasons, the drag car usually will pull out first and block traffic to allow the rest of the group out into the road and then fall into position at the back again. Being the Leader is a demanding and challenging task because he or she has the well being of many people and their cars in their hands. 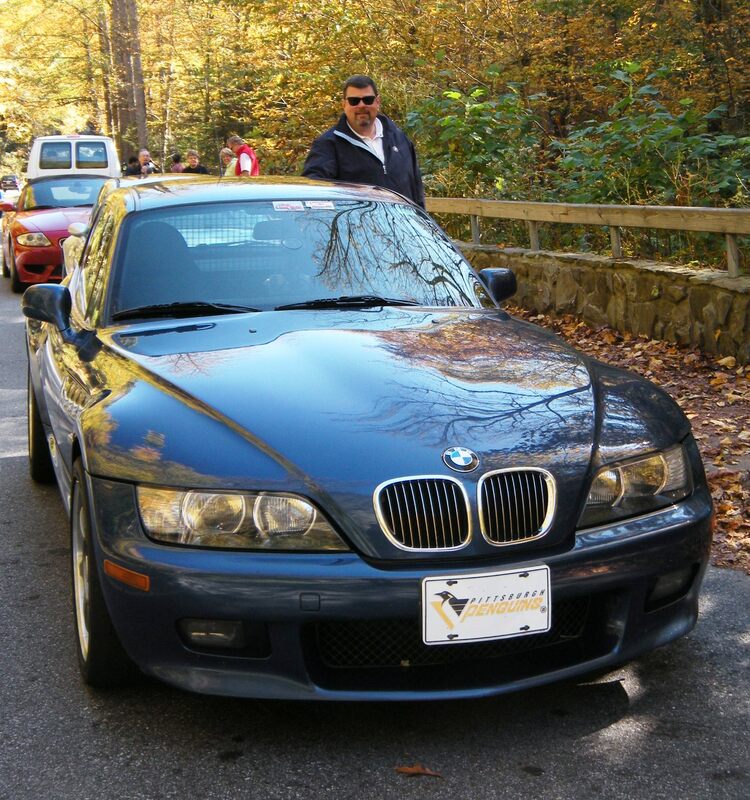 Riding drag, which I have done on a few occasions, is fun because of the “Accordian Effect” that happens when a long string of sports cars are driving fast on mountain roads. The slower drivers will sometimes cause gaps and the line of cars will get spread out. When the line needs to tighten up again, the line will come back together and the person riding drag will suddenly find themselves with a lot of room between his car and the one in front of him and can have a little more fun playing in curves as the line stretches and contracts like an accordian. The downside is that if the group doesn’t get through a light, the person riding drag will always have to herd them along to catch up to the rest of the group. Two way radios are essential for quick, short messages, especially in mountain areas where cell phone coverage is spotty at best. 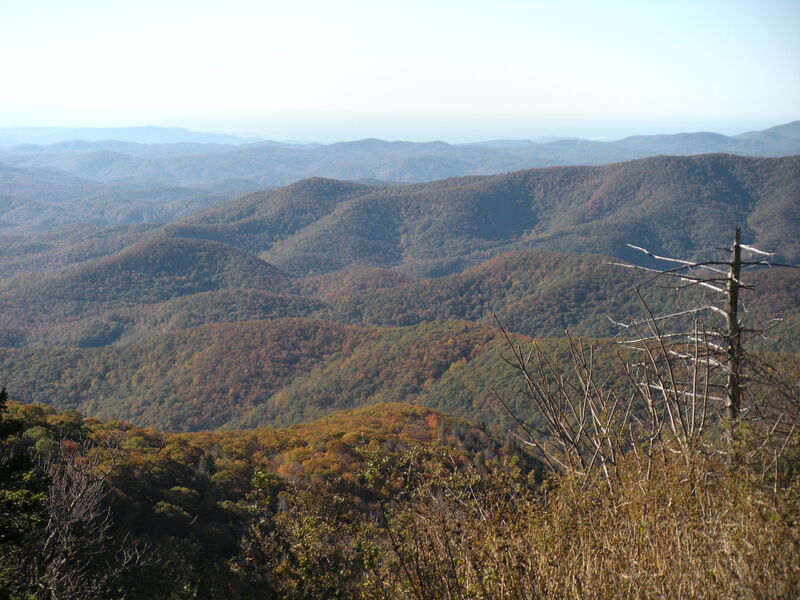 The Blue Ridge Parkway turns 75 this year and is a well maintained road with plenty of hairpin curves, straightaways and lots of uphill and downhill running. Whatever your favorite part of driving a high performance car is, you can find it on the parkway and one of the best things about it is that it is all natural. The only signs you will see are those warning of road curves, limited visibility, speed limits (what are those?) and where pulloffs are to get great pictures. We stopped at several of these to make pictures and stretch. You won’t see mailboxes, houses or businesses on the federally-owned and controlled parkway. You will see nature as it was meant to be seen, clean and pristine, from North Carolina to Virginia. We only rode for about 50 miles on the parkway, which takes a while on such a road. Brevard, North Caroline was our next stop, for lunch at a downtown cafe. Brevard is a beautiful, well preserved town with a lot of stores selling everything from shoes to books to novelties and toys. 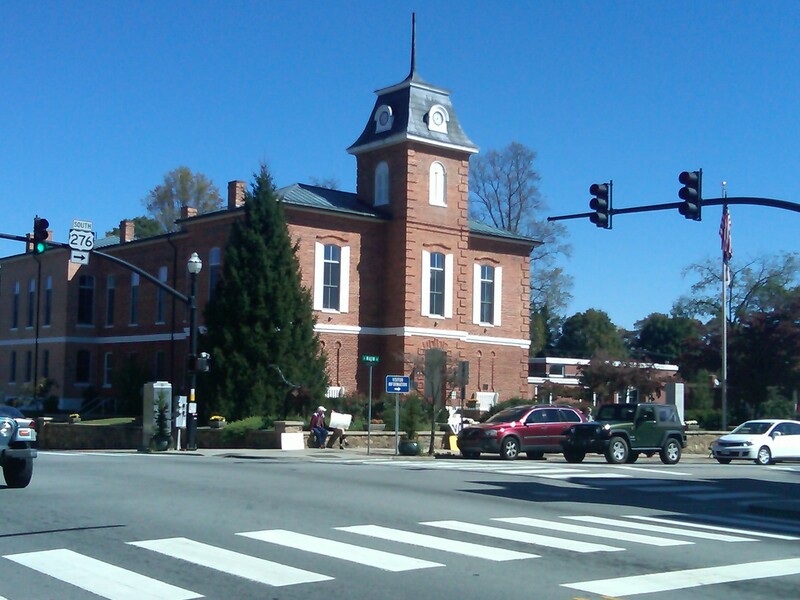 We didn’t have long to tarry in Brevard but the downtown is a picture perfect collection of old buildings from its Second Empire style courthouse to its Victorian style stores and buildings. From there, we left out and drove through much of the valley country between Brevard and Waynesville, enjoying the view of the mountains from the ground while still finding plenty of fun places to drive. Our last leg of the journey consisted of a 32 mile long two lane road that had about 300 tight curves and hairpins, a rarity in that it had just recently been paved and was in new condition. Despite getting slowed down by some slow drivers (most of whom graciously pulled over and let us come by) it was a fun road to drive and a good test of reflexes, skill and driving ability. We arrived back at the Creekside about 4:30 in the afternoon, tired but excited about the success of another “drive” and the absolutely beautiful weather we had for it. Cold mornings gave way to pleasant afternoons and perfect droptop weather for the convertibles, which outnumbered the hardtops 15 to 1. After a great dinner, we gathered for another annual tradition, the post-drive party by the creek behind the Creekside Lodge. We build a large campfire, roast marshmallows and relive the day’s drive, recounting the funny things that happened, rehashing drives of past years and enjoying good company and good times. We talk about where we might have the next drive in the Spring and what venues would best suit it and we remember those who are no longer with us, those who have moved and those who have passed on. As the evening continues, we have the annual pin ceremony where we celebrate drivers who have reached a milestone number of fall drives, currently either 5 or 10 drives (we have only had 11 Fall Drives so it will be a few more years before anyone will see a 15 drive pin). I was fortunate this year to receive my 5 year pin which has the names of the paticpating clubs on it and the number 5, making me officially a “Fall Drive Veteran”. I was very happy to receive my pin this year along with others who received theirs. That’s just lovely – thank you so much for sharing your feelings about a place I hope to see someday. You help me feel what it is like to be there and to love it.